The scene of the incident in Forfar. 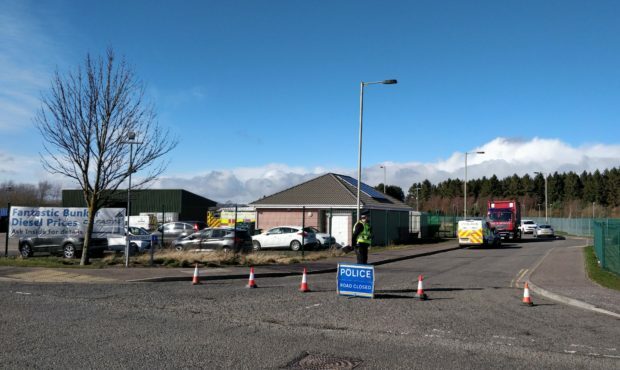 Speaking for the first time since Friday’s industrial accident, a spokesman for Oilfast confirmed it was an external supplier’s employee who lost his life whilst repairing a six-wheel oil tanker at the Forfar depot. The accident prompted a full-scale emergency response on Friday morning including the air ambulance. It is understood the tanker fell on him but despite the best efforts of specialist teams, the man couldn’t be saved. He died as a result of his injuries. A spokesman for Oilfast said: “Oilfast are devastated to disclose that a tragic accident took the life of an external supplier’s employee whilst he was attempting to repair one of our vehicles at the Forfar depot on Friday.